There’s a real question of which players are the first choice in either position on the flanks. This problem isn’t due to lack of quality, it’s quite the opposite. Caitlin Foord seems a lock-in for one of those wide positions. 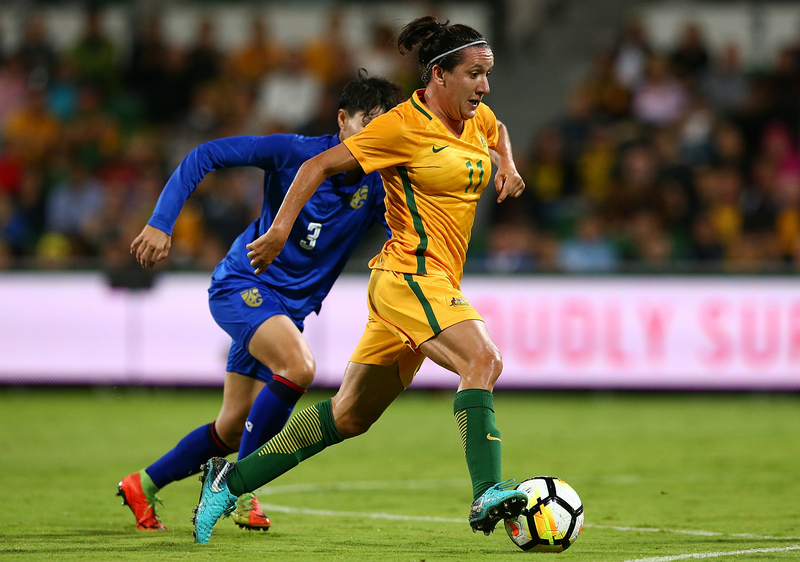 Able to switch with Sam Kerr to play more centrally, she has pace to kill and an eye for goal, so it will be a matter of who will be Foord’s partner in crime on the other flank. Emily Gielnik and Hayley Raso appear to be in an arm wrestle for the other starting spot. Their current form forcing both of them onto the list of names to be heading to France. Whilst it’s a flip of the coin on who to start out of the two, both have pace, hunger for the ball and can change a game up in the space of seconds. The other two players to make up the Cup of Nations squad as wide forwards were Princess Ibini and Lisa De Vanna. Ibini not only brings youth, but has gone on to prove her stocks with recent performances and form for both the Matildas and Sydney FC. De Vanna provides something different than the current list, her experience. She’s got more caps, goals and World Cups under her belt than her other attacking counterparts. Despite not being in the patch of form as other forwards in the squad, to have De Vanna’s experience during the World Cup would be invaluable. To provide more of a headache for Milicic, there are some other players who could have a shout at given a chance to wear the green and gold. For some more youngsters, you’ve got Nikki Flannery, Anna Margraf and Teigan Collister. This trio have provided some talent and excitement this season at different times. None have the experience in the national team set-up as the current pool of players, however all have the potential and skill to one day reach it. A bit more consistency and experience could see any of these three really pushing for a spot. For now, it’s too much too soon. Another outsider to really consider is Georgia Yeoman-Dale. Sure, playing for Western Sydney Wanderers didn’t help anyone’s cause this season, but Yeoman-Dale really spiced things up on the flank and had a formidable season in the NSW NPL prior. A player who can also be utilised at full back, Yeoman-Dale could provide a versatile option, bringing a lot of pace and ability. Perhaps her play is too similar to Raso, with Raso having the edge on form and being in the squad. Yeoman-Dale is still an outsider to have a look at. In addition to these outsiders, let’s not forget Ellie Carpenter, who would be well worth a shot as a wide forward. Spending some quality game time up front for Canberra United this season, if the Matildas could find some quality at right back, Carpenter has the explosiveness and creativity to be a game changer further up the flank.